CANNIBAL FEROX: How Lenzi Got His Cannibal Groove Back – Schlockmania! Pity poor Umberto Lenzi: this journeyman of Italian genre cinema had one of the most original moments of his career when he pioneered the Italian cannibal flick with his 1972 adventure opus Man From Deep River only to have another filmmaker capitalize on it. It was Ruggero Deodato who picked up the ball and ran with it, making The Last Cannibal World (a.k.a. Jungle Holocaust) and the all-time classic of this strange subgenre, Cannibal Holocaust. When the latter became an international moneymaker, Lenzi set out to get his flesh-eating groove back. First, Lenzi made the Jonestown-inspired Eaten Alive. However, it was his next film, Cannibal Ferox, that allowed him to reclaim the throne of cannibal flick notoriety. 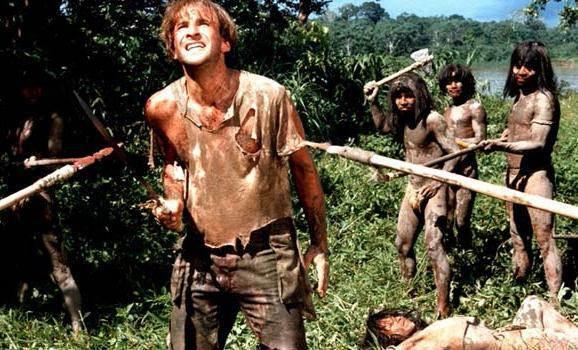 It has gone down in grindhouse history as the gleefully exploitative flipside to Cannibal Holocaust‘s cerebral cruelty, an opus of pure exploitation that delivers the gore-soaked goods with sadistic single-mindedness. Cannibal Ferox intertwines two plot threads. The first deals with Gloria Davis (Lorraine De Selle), an anthropology student who treks to the Amazon to get evidence that will prove her doctoral thesis: namely, that cannibalism is a myth created by white men. She brings along her brother Rudy (Danilo Mattei) and her good-time girl pal Pat (Zora Kerova). Things get off to a bad start when their jeep breaks down in the middle of the jungle. In short order, they run into the focus of the other plot thread, Mike Logan (Giovanni Lombardo Radice). He’s a sleazeball cokehead who has fled NYC for reasons unknown. He claims he and his wounded partner Joe (Walter Lucchini) were attacked by cannibals. While everyone tries to figure out how to escape the jungle, Gloria and her friends notice how odd the local tribe is acting – and realize that Mike’s story doesn’t add up. Soon, Mike’s secret actions will be revealed – and his fellow tourists will discover how and why jungle cannibalism really occurs. The resulting film is an interesting lesson in how subject matter is shaped by the concerns and obsessions of the filmmaker. Cannibal Holocaust offsets its savage content with a grim social critique that not only shocks the audience but challenges them to think about how they perceive what they are watching and why. Cannibal Ferox has no such ambitions. 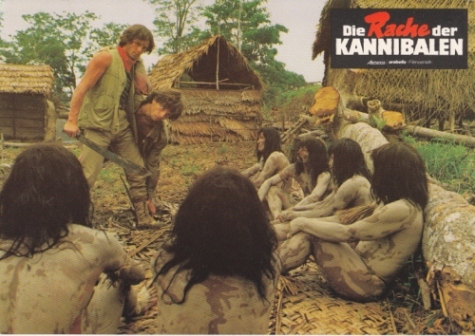 It takes the most controversial elements of Cannibal Holocaust – cannibalism, animal cruelty, Western society’s fear of the third world – and refashions them into a twisted commercial exercise for extreme horror fans. On that level, Cannibal Ferox is a brutally efficient piece of work. Lenzi goes for a snappy pace and makes sure to throw in a bit of sleaze, violence or mondo-style shock imagery every few minutes (on the latter note, he will infuriate a big segment of viewers in the way he doubles down on the amount of hard-to-watch animal death footage that is a staple of Italian cannibal movies). As a result, the film has a macabre funhouse energy that keeps the viewer wondering what awful thing waits around the next corner. He really goes to town in the film’s last half-hour, which puts the cast thr ough its paces in a barrage of tribal punishments, escape attempts and acts of cannibalism. In fitting Italian exploitation style, he tops it with a coda that offers a bleak, comic book expression of irony. If you can hang in there with the ghoulish excesses, Cannibal Ferox also has a campy side to it that adds some unexpected fun amidst the thrills and gut-spills. For example, the funky horror-disco score by Budy Maglione is irresistably catchy and Lenzi’s script is full of quotably sleazy dialogue, most of it from Mike. It also boasts a career-best performance for Radice, who takes a paper-thin villain characterization and makes it unforgettable with his displays of wild-eyed, feverishly intense nastiness. The other performances pale in comparison but Mattei provides solid backup, De Selle makes her character’s suffering easily believable and Kerova steals a few scenes as the trashy pal who picked the wrong vacation. To sum up, Cannibal Ferox is the other twin titan of Italian cannibal film cycle, a grotty little exploitation anti-classic that sums up that country’s contribution to grindhouse cinema in the early ’80s. It’s grim, sleazy, exploitative and never misses a chance to punch the viewer’s buttons – and that combination ensures it has an enduring reptile-brain appeal for any shock-horror fan looking to test their limits.